You’re riding your motorcycle and spot the perfect fishing spot, but you have no gear. You’re at work, and a friend lets you know that the fish are biting at a lake on your way home, but your gear is at home because it just takes up too much room. You’re traveling cross-country, but you don’t want to pay to check your tackle. We get it. You’re serious about fishing. You might be inspired to fish right now, right there. You may even find your next great catch on your way home from work. To be prepared anytime, anywhere, you may want to buy the Daiwa Mini System Minispin Ultralight Spinning Reel and Rod Combo. Daiwa is a reputable name in fishing. It produced its first spinning reel in 1955 and is now one of the largest tackle companies in the world. The company began U.S. operations in 1966 in Culver City, California and now sells gear throughout the United States, Canada and Central and South America. Daiwa has always emphasized innovation and quality, and many of its designs and materials have now become standards for the industry. Daiwa’s minispin system definitely lives up the company’s standards, as some users report having used the system for years and even buying additional systems for gifts. Backpackers love this tackle because it does not take up much space in the pack, and it’s also a good choice for younger anglers, so you can pass on your love of the sport to the next generation. This system won’t empty your wallet or weigh you down. You can pick up this compact rod and reel for an affordable price on Amazon. With a total weight just over 14 ounces and sized at just 13.8 x 3.9 x 7.1 inches, this is truly a go-anywhere system. 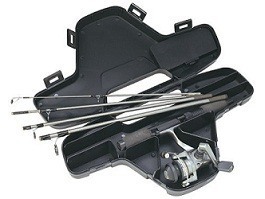 The hard case not only protects the rod and reel, there’s space available for your tackle too. Throw it in your luggage, take it backpacking or store it under your car seat or even in a motorcycle saddlebag. You’ll be ready to cast whenever and wherever the mood strikes and the fish are biting. The minispin system features an ultralight MS-S500T reel with a smooth ball-bearing drive, multi-disc drag, 4.9 to 1 retrieve. The matching rod is a 4.5-feet, five-piece ultralight rod for 2-6 pound test lines and 1/16- to 1/4 ounce lures. This product, like all Daiwa products, includes a limited manufacturer’s warranty against material and workmanship defects. As an ultralight, the minispin is great for catching smaller fish, but that doesn’t mean it’s exclusively for catching bait fish. While angling for extremely large fish with this system is not advisable, catching larger fish simply requires more skill with the tackle. Avid fisherman might actually enjoy the feel of reeling in a larger catch with this lightweight Daiwa. The five-piece system assembles quickly and easily. The reel handle is foam and can be adjusted for lefties. For tackle that breaks down into the size of a lunchbox, you’ll be more than pleased with the portability and convenience. You’ll likely prefer using it rather than renting when you travel to your favorite fishing locale. The case protects the system and holds a few additional items, giving you everything you need for a spur-of-the-moment cast. If you’re angling for small to medium fish and want to be able to take your tackle with you by plane, train, automobile or motorcycle, then Daiwa’s Mini System Minispin Ultralight Spinning Reel and Rod Combo may be just what you need.